RULING PARTY TO WIN AGAIN? CCM TO WIN NEXT TIME TOO? Following a serious rift with Tanzania’s only significant opposition party, the National Convention for Construction and Reform (NCCR-Mageuzi), many political observers believe that, unless there can be a reconciliation or the emergence of some new leader, the ruling Chama cha Mapinduzi (CCM) party, even after 36 years in power (including the period of its predecessor TANU) is destined to come out on top again in the next general election in the year 2000. But not necessarily. Three years is a long time in politics! TA has been told that the ‘intellectual wing’ of the NCCR led by the lawyer who founded the party, Mr Mabere Marando, became convinced some time ago that the chairman of the party, the charismatic and energetic former Deputy Prime Minister, Augustine Mrema, was not the right person to represent the party in the next presidential elections. His dominating personality, unpredictability and relative lack of education were held against him. Marando (who had been the founder of the party and its first chairman) had given way to Mrema and agreed to him taking over the chairmanship of the party in 1995 and it was Mrema who had rejuvenated the party and presented a serious challenge to the CCM in the last elections. During the last year Marando and his supporters are believed to have tried to persuade Mrema to resign or to undertake further studies overseas but Mrema was said to have refused. Joe Dotto writing in the ‘Business Times’ described Mrema as ‘a hot potato which cannot be spewed out because it is sweet nor swallowed because it is hot!’ The Marando wing of the party are reported to have lobbied other prominent former CCM leaders in the hope that they might join CCM and offer a challenge to Mrema but without success. Thus, when the NCCR party gathered for a week of meetings in Tanga on May 8, tensions were high and the Mabere wing of the party, which includes almost all its 19 MP’s, decided to try and remove Mrema (who has the support of the mass of members of the party and almost all regional chairmen), from the chairmanship of the party. The various meetings which took place during the week in Tanga were acrimonious and punctuated by physical confrontation, name calling and even tears. When the lights went out temporarily during the meeting, there was some panic and a few people were injured as they tried to escape from the room. Party Chairman Mrema delivered a long speech accusing Marando of accepting a bribe from the CCM to get rid of him. Marando, in reply, accused Mrema of embezzlement of party funds, failure to follow party guidelines and leading the party ‘like a dancing troupe’. The main conflict at the meeting was between the 30-member Central Committee which largely supported Marando, and wanted to remove Mrema from office and the much larger Executive Committee which supported Mrema. The Marando faction then attempted to gain ascendancy by bringing in the law. Mrema was relying on his wide popularity. Marando appealed to the High Court to bar Mrema from acting as chairman and from access to the party building and from party funds. He suggested that Mrema should form his own party. But on May 16 the High Court dismissed Marando’s application because it had been improperly drawn. The constitution of the party apparently makes it almost impossible to remove leaders. Meanwhile, Mrema’s supporters had seized the party HQ at Manzese in Dar es Salaam and made sure that the Marando faction were kept out. Marando later found other quarters in Gerezani, Dar es Salaam and took the original NCCR Secretariat staff with him. Mrema dismissed Marando and chose Mr Prince Bagenda, as the new party Secretary General and also appointed a new list of party officials and a new secretariat. Bagenda was the leader of a group of the NCCR which had broken away, three years ago, from Marando’s original NCCR before Mrema joined. With the arrival of Mrema as chairman, Bagenda rejoined the party but was not given a prominent position. On May 28 and 21 Registrar of Political Parties George Liundi tried hard, during lengthy meetings, to bring the two factions together but failed. He said that he could not deregister a party which had internal conflicts but the law said he could do so if a party was split. The Mrema faction’s new Executive Director, Dr Ndembwela Ngunangwa has told TA about the efforts of Bishop Elinaza Sendoro of the Evangelical Lutheran Church of Tanzania to mediate between the two faction leaders but he too failed. NCCR members are bitterly disappointed by the behaviour of their leaders whom many accuse of being interested in power and money rather than the good of the country; “If Mrema can’t manage his own party, how can he run the country?” is a common refrain. But although Mrema’s popularity with the masses has been dented it has not disappeared; people continue to admire him for his vigorous attacks on corruption when he was Minister of Home Affairs in a previous government. An increasing number of his more politically aware supporters are, however, expressing the view that he is not the best person to face CCM in the presidential elections in the year 2000. The Daily News (July 29) quoted Mrema as saying, at one of the many rallies he has been addressing since the party split, that he was ready to go to jail in a case in which he is accused of uttering false documents implicating senior government and CCM officials of bribery; “In Africa” he said “prison graduates sometimes become presidents”. Referring to the Marando faction: “These people want to get rid of me. They are not obedient to me – their top boss. How can I continue working with them? I want people who are ready to obey my orders in the Central Committee…. I am the very final NCCR-Mageuzi commander” he said at one meeting, amid laughter from the audience. On July 21 Mrema surprised a large rally of his supporters in his Temeke constituency by saying that he was not the automatic choice of the party for the next presidential election; if the party found someone more suitable he would travel all over the country in support of that person. Many observers fear that what has happened has severely damaged democracy in Tanzania as the NCCR is the only viable opposition at present. But Professor Mwesiga Baregu of the University of Dar es Salaam, writing in the Dar es Salaam Guardian (July 1) said that he would have been surprised if such conflicts as those seen in the NCCR had not occurred. ‘In a period of transition towards true democracy, conflict within a political party is not the source of death’ he wrote ‘but the source of growth, transformation and renewal’. UDP chairman and deputy leader of the opposition in Parliament, John Cheyo, who is well-known for his pragmatic approach, advised NCCR leaders to take one month of leave ‘to cool off’. The Registrar of Political Parties has withheld a $101,269 government subsidy to the NCCR party pending clarification of the situation. A further indication of the damage the party has done to itself came when it had to select a candidate to fight a by-election in Makete. The Election Registrar refused to issue two sets of nomination papers to one party and so, on August 25, the CCM candidate Dr Harry Kitine, was declared elected as the MP unopposed! Political observers are looking around to see if anyone else might be eligible to lead Tanzania into the new millennium apart from President Mkapa, who is now the undoubted favourite. One person who was believed to have considered the possibility of taking part in the last presidential election and who is taking an increasingly prominent public role is Mr Reginald Mengi – Tanzania’s self-made wealthy businessman and media mogul. He owns English and Swahili newspapers and the ITV station. These outlets have been giving increasing amounts of space to his activities in recent weeks, in particular to his new role as Chairman of the National Environment Management Council, but he continues to say that he is not interested in entering the political arena. According to the Dar es Salaam Guardian, Mtikila later insulted CHADEMA leaders and he has since been expelled from the party. Meanwhile the opposition Civic United Front (CUF) expelled seven of its leaders on April 4 because the group wished to recognise Dr Salmin Amour as President of Zanzibar. And the UDP party lost its Vice-Chairman, Ambassador Christopher Ngaiza following disagreements between him and party Chairman John Cheyo. On August 25 there was, at last, some good news for the opposition. The High Court nullified the 1995 parliamentary election result for the Muleba constituency in Karagwe Region and CCM MP Wilson Masinlingi lost his seat. The person opposing him at that time was Mr Prince Bagenda who has been in the forefront of the troubles in the NCCR party (see above). The by-election in this constituency is likely to be hard fought if the NCCR can agree on its candidate. Exemplifying the political distinctiveness of Zanzibar and the intensity of the tension between the two parties there – the ruling CCM and opposition Civic United Front (CUF) – which hold respectively 26 and 24 elected seats in the Zanzibar House of Representatives – was a bizarre incident which has been featured in banner headlines in the Tanzanian media. Mr Salum Mbarouk (29) MP for Mkunazini announced on August 1 that he was resigning from parliament. He won the seat in the 1995 elections with 2,730 votes compared with 1,113 for the CCM candidate. On August 2 he appeared on television to explain why; it was because the political conflict was exacerbating ethnic tensions and his belief that the boycott of the Isles’ House of Assembly by CUF had gone on long enough, he said. The Dar es Salaam Guardian then reported, on August 6, a lengthy story from Mr Mbarouk about how he had been taken, in mid-July, to a government house on the West coast of Zanzibar and had been offered by senior government officials (whom he named) substantial salary and allowances, a post as special adviser to President Amour and a chance to stand in the inevitable by-election as the CCM candidate if he would give up his parliamentary seat. When he refused he said that he had been forced at gunpoint to announce his resignation in front of a TV camera and forced also, with a threat that otherwise he would be thrown into the Indian Ocean, to sign a resignation letter addressed to the Speaker of the House. He said that he had been ferried to Dar es Salaam on July 26, returned to Zanzibar and again to Dar es Salaam where he had been concealed in the Agip Motel, Room 307. On August 4 he said that he had managed to escape to Magomeni where he spent the night in the Mosque; on August 5 he took refuge in the Swedish embassy accompanied by CUF officials. CCM sources ridiculed this story and claimed that, having resigned voluntarily, he then had to take measures to protect himself from angry CUF supporters. It was the CUF which had kidnapped him. Meanwhile, on August 7, the Zanzibar Electoral Commission (ZEC) announced a timetable for a by-election in the Mkunazini seat even though the Union Government, which is usually reluctant to interfere in Zanzibar’s internal affairs, had promised, only two days before, to carry out a thorough investigation of the whole matter. According to the Daily News, the government spokesman was responding in parliament in Dodoma to a motion from Deputy Opposition Leader John Cheyo MP and leader of the UDP party, calling for the arrest of those responsible for the alleged kidnapping. On August 11 Prime Minister Frederick Sumaye told the National Assembly that Mbarouk was in the hands of CUF leaders and that they would be held responsible for any harm that came to him. He said that Mbarouk had presented a typed letter of resignation on July 15; he had been asked to present it again in his own handwriting and had done so indicating that his resignation would take effect from August 1. To add to the mystery the Guardian reported that the signatures on the two letters might be different. On August 9 the Daily News reported that the CUF would file an application in the Zanzibar High Court seeking to stop the Mkunazini byelection as Mr Mbarouk was still the MP for the constituency. On August 15 the Daily News reported that three top CUF leaders including Mr Mbarouk had been summoned to the office of the criminal investigations department. Clearly, one side or the other is not telling the truth. Political analysts can see a clear motive for the CUF to be bringing the case into the public eye and particularly to international attention and for not wanting to lose one of its MP’s. In the case of the CCM the motivation for kidnapping is difficult to understand, but CCM’s determination to retain control in Zanzibar is apparent. The unaccustomed speed of the Zanzibar Electoral Commission in announcing the date of the by-election, gave grounds for some observers to have their suspicions about the ruling party’s intentions. In a rapidly moving situation, as this issue of TA went to press, the police were said to be looking for Mr Mbarouk. The political deadlock in the Isles continues as the CUF still refuses to accept the last election results and is boycotting the House of Assembly in the Isles (though not the Union National Assembly in Dodoma). Many in Zanzibar must have had high hopes when it was announced that an international conference on democracy would be held in Zanzibar in July and that the UNDP had been involved in preliminary planning with Speaker of the National Assembly Pius Msekwa. But the UNDP subsequently withdrew. Among those who spoke at the conference, which was chaired by Judge Joseph Warioba and attended by President Chissano of Mozambique, was Zimbabwe-based journalist David Martin who said that the original cause of the divisions in Zanzibar had been the internal election which had immediately preceded Zanzibar’s independence in 1963. At that time the party then representing African interests had won a clear majority of the popular vote but that parties largely representing Arab interests, ‘with British collusion’ won most of the constituencies and formed the government. The situation then had been like it was now he said but the result had been the violent revolution of January 12,1964. Martin said that he did not want to be drawn into a debate about the rights or wrongs of the 1995 elections in Zanzibar (which precipitated the present deadlock) and went on to attack the attitude of Western diplomats in Dar es Salaam (two High Commissioners were said to be leaving shortly – he hoped their successors would be more open minded) and the former colonial power in particular, for its ‘intemperate negativism’ in refusing to deal with Zanzibar President Salmin Amour and for giving the CUF the impression that it still had the support of the West in its refusal to reach a compromise with the government. A dozen Britain-Tanzania Society members visiting the Parliament in Dodoma on August 14, during Tony Janes’s annual study tour of Tanzania, were taken by surprise when, during a very friendly welcome address by House Speaker Pius Msekwa, Prime Minister Frederick Sumaye strolled in and joined the party for a lengthy chat. The society’s Tanzanian Chapter Chairman, Paul Rupia MP, who arranged the visit with Margaret Mwaja, a friend of BTS Treasurer Betty Wells, had himself been surprised earlier, when each member of the group sitting in the visitors gallery, had been introduced individually to the assembled MP’s by Deputy Speaker Philip Marmo. This was most unusual said Mr Rupia. The day before, while visiting Mvumi Hospital, BTS members had had a further surprise when they bumped into Foreign Minister Jakaya Kikwete, who recognised members he had met last year at a meeting of the Society in London. Five police officers charged with the murder of former Director of Intelligence Lt. Gen. Imran Khan (TA No 57) pleaded not guilty in court on May 29. The Prosecutor said that on June 30 1996 the Dar es Salaam Regional Police Commissioner had ordered two police officers armed with Chinese-type pistols (three more joined them, armed with a machine gun, in Moshi) to look, in the Moshi and Arusha regions, for a vehicle stolen in Dar. They spotted a Nissan Patrol vehicle with registration number TZD 8592 similar to the one stolen and began to fire at it. Nineteen bullets were fired of which five killed the Lt. General. The case continues. According to newspaper reports the Board of Directors of the Sugar Development Corporation (SUDECO) suspended in May seven senior officials following the loss of Shs 2.7 billion worth of sugar. Three officials in the Finance Department of the Mtibwa (Morogoro) sugar factory have been sacked far ‘failure to prevent embezzlement of funds by subordinates’. The Minister for Science, Technology and Higher Education has announced that 179 civil servants had been sacked and 53 suspended for receiving bribes between January and May. The Minister of Justice and Constitutional Affairs has stated that two magistrates have been dismissed and 40 others suspended in connection with corruption allegations. The Minister for Communications and Transport was reported in the Daily News at the beginning of May as having suspended the Director General of the Directorate of Civil Aviation for alleged indiscipline and insubordination. Tanzania’s Markets and Securities Authority has approved provisional licenses for five brokers/dealers (Tanzania Securities, Exim Securities and Investments, Rasimali, Solomon and Orbit Securities) to trade on the country’s STOCK EXCHANGE which is scheduled to be launched in Dar es Salaam in October. Meanwhile, Tanzania Oxygen, a leading manufacturer of industrial and medical gases became in April the first company to launch its prospectus; it will sell 30 million shares to the public – Business in Africa and East African. Following the recent $1.7 billion debt relief agreement at the Paris Club in February (TA No 57) Tanzania has now reached AGREEMENT WITH FOUR OF ITS 12 MAJOR CREDITORS (France, Germany, Norway and Austria) and has assured donors that it will service its external debt promptly and ensure that it remains credit worthy. It hopes for further debt relief at the Paris Club next year – East &can. TWO NEW BANKS opened for business in mid-August – the indigenous Akiba Commercial Bank with 207 indigenous shareholders and Rabobank of the Netherlands as its partner, and Exim Bank (Tanzania) catering primarily for corporate clientele with 80% Tanzania local shareholding – East African. The government has reduced CORPORATE TAX from 35% to 30% as a ‘compensatory measure to mitigate revenue obligations while giving relief to taxpayers’ – Business Tunes. The NATIONAL BANK OF COMMERCE has collected some Shs 1.13 billion from 28 debtors under its loan recovery drive during the past few months – Sunday News. Tanzania has completed the installation of sophisticated new CARGO AND PASSENGER X-RAY SCREENING EQUIPMENT at the Dar es Salaam and Kilimanjaro airports in response to concerns expressed by airlines flying into the country – East African. “ENGINEERS, of whom there are now more than 5,000 in Tanzania, are being under-utilised as there are now more than the country can afford” said Dr. Strato Mosha, Director of Inter-Consult Ltd (he is also Vice Chairman of the Tanzanian Chapter of the Britain-Tanzania Society) at a recent seminar. He went on to say that the ratio engineers:technicians:artisans was 1:3:9 which indicated the critical shortage of technicians and artisans. Engineers had to work without technical support and might actually have to do work best left to technicians. However, engineers constituted only about 0.5% of the total waged employees compared to 4-6% in developed countries – Financial Times. The POPULATION of Dar es Salaam has reached 4.5 million. Regional Commissioner Brig. Gen. Hassan Ngwilizi said that this population growth was a serious threat to the wellbeing of city residents – Daily News. Speaking at a dinner in honour of visiting Chinese Premier Li Peng on May 13 President Mkapa defined TANZANIA’S ECONOMIC POLICY as the ‘development of a market economy with internal characteristics’. Tanzania wanted to learn from Chinese experience. “Economic and social justice, respect and dignity must never be sacrificed at the altar of unguided capitalism” he said. The Dar es Salaam firm A C Gomez has bought and started rehabilitating the KUNDUCHI BEACH HOTEL – Daily News. The Minister of Finance announced on August 14 that the government had suspended issuing LOAN GUARANTEES to public enterprises in a move to control the country’s debt burden. Cabinet approval would be needed by ministries and parastatals before any further debt could be incurred – Daily News. NEW AID for Tanzania: Shs 30 billion from the EU for rehabilitation of areas affected by refugees and Shs 1.6 billion for education; Shs 17 billion from the Netherlands for rural development and other projects and Shs 7 billion for dredging Dar es Salaam port; Shs 16.7 billion from Japan for three bridges on the Mtawara-Mingoya road and for power supplies; Shs 15 billion from the UN Population Fund; Shs 3.2 billion from Switzerland for two development funds and a further Shs 15 million to fight a cholera epidemic in Dar es Salaam which has claimed scores of lives; $7.8 million immediately for balance of payments support and probably a further $23.4 million later in the year from Sweden; $24 million from Denmark for the development of Tanzania’s private sector; a $1 5.7 million loan from China to revamp the TANZAM railway and for other projects. Tanzania’s new 3 16-page TELEPHONE DIRECTORY, the first since 1992 was issued (free to those with telephones) at the beginning of May. Some 92,760 telephone lines are now connected in Tanzania – Business Times. The debt ridden Dar es Salaam University Press and University Bookshop have been merged and are being privatised as BUP (1996) Ltd. – East African. There has been a sharp down-turn in PASSENGER AND CARGO BUSINESS ON THE DAR ES SALAAM – ZANZIBAR SEA ROUTE following the harmonisation of import tariffs between the mainland and the Isles; this has made it no longer profitable to buy goods in Zanzibar and sell them on the mainland. But one company, Azam Marine, has invested $4 million in two new speed boats which travel at 30 knots and have a capacity of 180 people each. The company is banking its hopes on the novelty and newness of the boats and the growing tourist boom in Zanzibar. Some of the other boats on the route are old and have been known to stall sometimes midway between the two points – East African. TANZANIA’S 1997/98 BUDGET (June 19) emphasised promotion of the private sector and investment, especially in mining, but there was little of help to the agricultural sector and duty on fertiliser was increased. In the interests of greater simplicity, the present customs duty bands have been reduced from seven to four and sales tax bands from six to four. Minister of Finance Daniel Yona announced targets of 5% growth (4.2% in the present year) and 10% inflation. He said that he would raise revenue of Shs 695,000 million (17.1% of GDP) and spend Shs 666,842 million; indebtedness to local banks would be reduced by Shs 59,695 million. Features of the budget included reduced taxes and duties on some beer (much heavier taxes on European beers) and soft drinks but a new 25% tax on bottled water. The cost of transport has been increased; there is a 30% excise duty on four-wheel drive vehicles. The hotel levy, withholding tax on business insurance claims, excess profits tax on single trade transactions, sales export tax and stamp duty on mineral exports have been abolished. Civil servants will get a modest pay rise. Zanzibar Finance mister Amina Salum Ali said that implementation of the 1996/97 budget in the Isles had been impaired by a severe shortfall in revenue caused largely by the boycott by many donors following the last elections. But the government had taken effective action to build up and consolidate the economy while at the same time widening the economic base in order to make it more equitable. Revenue from tourism had increased substantially. Mwalimu Julius Nyerere had a very busy week in London at the beginning of June. Even though he was suffering from malaria he fitted in three public engagements at which he delivered three speeches. On June 3rd he spoke to a glittering audience including four high commissioners, almost fifteen diplomats, several members of parliament, a large number of big businessmen and many others assembled by the European- Atlantic Group under the chairmanship of Lord Judd of Portsea. His subject was ‘Africa Today and Tomorrow’ and he pungently attacked many of his favourite targets like the IMF and the World Bank (“the bank created wealth and poverty at the same time”), neo-colonialism etc. His Michael Scott Memorial Lecture June 4″ at the School of Oriental and African Studies, under the auspices of the Africa Education Trust, on the subject of ‘Africa and Education in the 21st Century’ was less inspired and rather sombre as he presented a bleak picture of what had happened to education in Tanzania in recent years and the terrible debt burden the country was facing. He attacked selection in education and said that the growth of private education was encouraging class differences. During questions Mwalimu said that when the British ran East Africa they wanted to make Swahili the main language in all three countries. Kenya said no – it would mean an inferior education; Uganda said no because the Baganda wanted Luganda as the national language. 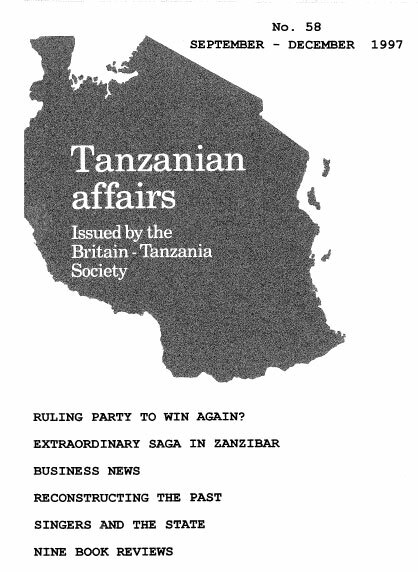 Tanzania was very backward. “We had no view!” he said. So Britain decided to make Swahili the language of Tanganyika and Zanzibar. The language which was then developed was that from Zanzibar and not Swahili of Mombasa. On the ongoing debate about whether Swahili should be used at all levels of education in Tanzania, Mwalimu said that he was now having to defend the use of English. English had now become the Swahili of the world! By the time he spoke to an enthusiastic audience at the London School of Economics on June 6th Mwalimu was on top form. He gave a fluent and inspired address on the future of the world in which he distinguished between those parts where developing countries were within the economic orbits of developed nations – the Arab countries and Europe; South East Asian countries and Japan; Latin America and the USA – but Africa South of the Sahara was different. It was isolated and would have to be more self-reliant. Countries would need to cooperate better with each other. “I share responsibility for the foolish action we took in dismantling the East African Community” he said. He discussed the present position in all the countries south of the Sahara and was pleased that almost all of them (except some in West Africa) now had multiparty rule. The days of military rule were coming to an end. He appealed to Europe and America not to meddle in Africa. “Let Africa make its own mistakes” he said. “I have complete confidence in the future of Africa” he concluded. On nationalisation and privatisation in Tanzania, Mwalimu said that he had no choice at independence. If he had left the economy to the private sector it would have become entirely Asian and there would have been racial conflict, Now, with plenty of trained &can businessmen, things had changed. But there should be some hesitation before privatising everything. “Privatisation now means foreignisation” he said. After taking about the way some African leaders had looted their countries he was asked why he hadn’t looted Tanzania (laughter). Mwalimu replied “Perhaps there wasn’t much to loot!” (loud laughter). He received a lengthy standing ovation. Mwalimu has been awarded an honorary degree by the University of Fort Hare in South Africa. It was in recognition of the immense contribution he had made to the struggle for the liberation of the African continent – Daily News. More VIP’s have been in Tanzania enjoying its tourist attractions. South African Deputy President Thabo Mbeki and his wife spent 11 days on the beach and at national parks in June, not long after a similar visit by King Harald and Queen Sonja of Norway. Writing a novel set in a time more than a decade before I was born is an intriguing challenge. Living in Zanzibar, I know the present-day town and islands well. Having access to the National Archives here (a national treasure!) has given me a good insight into the past. But what I wanted was the ‘pepper and salt’, the seasoning to help bring a vanished colonial past back to life. Happily, through ‘Tanzanian Affairs’ I came into contact with two excolonial officers: Brim Eccles (DO, Chake Chake, Pemba 1952-54) and Ethel Biron, nee Hardes (Nursing Sister, Zanzibar 1949-52). On ‘home leave’ last summer, I went to track them both down. I found Brian Eccles sitting at a pavement cafe table in the ancient town of Venice in the south of France. Ethel Biron I found in her garden in the town of Worthing in the south of England, together with her husband Hugh, who had worked in Zanzibar for Cable & Wireless. Brim Eccles comes from a long line of colonial servants, his great grandfather having been the first unofficial member of the Executive Council in Trinidad. When he joined the Colonial Service, “What was significant”, he recalls, “was that I was asked, ‘Was I prepared to make myself gracefully redundant?’ and that was in early 1952. It was reckoned that anyone who came into the Colonial Service should be prepared to leave, for the whole thing to wind up”. Ethel Biron had no family history in the Colonies, “When I applied, they said there’s a vacancy in Zanzibar and another one in Hong Kong. I liked the sound of Zanzibar, so I chose to go there”. Hugh Biron had an overseas history, his father having been abroad with the Eastern Telegraph Company in 1886. Brian travelled out with the Union Castle Line, and on arrival in Zanzibar Town remembers, “…it being infinitely more civilised and congenial than my father had suggested Sierra Leone and the Gambia were in his time. It was an agreeable surprise, I liked it, but when I got up to Pemba, it was very much more how I expected it to be”. Ethel Biron flew out, from a small Heathrow in a York transport plane. It took her all day to fly to Tripoli, where they spent the night, the next day flying on to Cairo for lunch and then Khartoum. The Thud day she flew on to Nairobi, and then took the overnight train to Mombasa. From there she flew in a ‘Dominie’, touching down in Tanga and eventually on the grass airstrip in Zanzibar. Not to be outdone, Hugh Biron told that he had first flow to Zanzibar in 1943 by flying boat down the Nile! Brian’s work as District Officer involved touring, “I used to spend four nights a week out travelling somewhere, and the other three nights I’d be back in Chake Chake. I would go in a car to some central point, and then walk around for four days”. “The District Supervisor, Sultan Issa, was in charge of getting the tent to where I was going to stay. It was a magnificent thing, and in fact had everything for an old style District Officer, even something purporting to be a Persian mat. It was totally unrealistic – I just felt embarrassed that so much was involved with one person staying in the shamba – so after the first or second expedition I had done with it. After that I used to sleep on the teacher’s desk in a school, put a Dunlopillo mattress on it and rig a mosquito net from the rafters”. “One of my jobs was to listen to all the different cases being put to me about the issue in hand, and then make a decision. We were discussing one day who owned the land. We knew who owned the clove trees and who had been cultivating between the trees, but who actually owned the land? Well, the Kadhi (Muslim judge) gave his opinion of what was Muslim law on the subject and the Mudir (junior administrator) gave his opinion as to what was local law, and I eventually made a judgement. And, when I did so, someone said ‘That’s the decision the last European DO came to’; it had all been decided before! And it was being re-hashed just to see if my opinion was the same – which by good luck (and judgement) – it was”. Ethel Biron commented, “people think it was a soft option, but it was hard work. You only had one month local leave in a two and half year tour. And as Nursing Sister, you found yourself in charge of a whole hospital”. Both Brian and Ethel learned Swahili in Zanzibar, “It would have been very easy to spend all your spare time playing tennis or swimming”, explained Ethel, “but it seemed essential to me to get on with learning Swahili, which I did, and got my exam in ten months. So I did speak the language fluently, and that’s one of the reasons they asked me to be Nursing Tutor when I was back there in 1957 with Hugh. “The common diseases,” she said, “were malaria, leg ulcers, hookworm, chest infections, and falling out of coconut trees – not exactly a disease – but very common”. There was also leprosy in Zanzibar then. Brian found himself charged with the task of handing out Eid-el-Fitr presents to the lepers in the colony at Wete, “I can remember I went up with the District Medical Officer, who said ‘It’s perfectly alright, they’ll all want to shake hands with you though they may not have hands, but whatever they offer; shake it”‘. Another lost aspect of colonial life – which looms large in the fiction and mythology of the times – is ‘The Club’. “There was what was called the English Club”, explained Ethel Biron, “to which one belonged as a matter of course. Somebody else on the staff would sign about your good character although you’d only been there for a few days, and you joined. It was somewhere to meet people not connected with the medical department. The Sultan’s band used to play there once a week and that was great fun”. Brim “never” came a member of the English Club. Why? “Well because it seemed to me to be totally remote from Zanzibar and Zanzibaris. When the Karimji Club started (a multiracial club) I became a member of that”. Both Brian and Ethel remember the Sultan – Seyyid Khalifa – Ethel being nurse to him on occasions during her first tour of duty, “He was very nice, a dear old chap and a great influence for good. Brim later became Seyyid Khalifa’s private secretary, and remembers him with great affection, “He was a dear old man. I never knew any of my grandparents, but I could not have wished for a better grandfather”. As was envisaged at the time of Brim’s recruitment, the empire, of course did wind up. What perhaps was not envisaged was the posthumous widespread denunciation of colonialism as being unremittingly bad. But speaking to two old colonial officers, what impressed me was the sense of public duty with which they worked; probably the most essential missing ingredient in the civil services of Africa today. I asked Brian how he felt when, after two years, he had to leave Pemba, “Oh, I didn’t want to leave at all, because I so much enjoyed my work, really enjoyed my work. I was just very happy there”.